Domain name parking companies are willing to pay $100s per acquired customer. Ever wonder why so many domain name parking companies are popping up? It’s because this is a very profitable business. In fact, domain parking companies are willing to pay $100s to acquire customers, if these companies’ bid prices on Yahoo (NASDAQ: YHOO) are any indication. I recently added a campaign for domain name parking in Yahoo! Search Marketing. I added the keywords “domain parking” and “domain name parking” and then let Yahoo tell me what I’d need to bid in order to expect having one of the “top listings” for the search term. 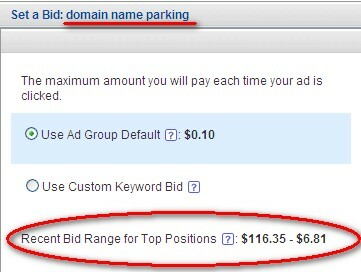 The number isn’t for the weak of heart: I need to bid between $6.81 and $116.35 per click! If you consider that parking companies can convert 1 in 10 visitors, that means they’re willing to pay between $68.10 and $1,163.50 per user at these bid prices. Yahoo considers ad quality in its calculations of necessary bid prices for top positions, so I tried a few different ads using actual parking companies’ URLs and the results were similar. The bid prices for the term “domain name” were $4.16-$15.04. Of course, no two domainers’ portfolios are worth the same. Parking companies need to market to the top domainers to get the biggest bang for the buck. No doubt. You spend some money developing a program, hire a few salespeople and customer service reps, spend some money on promotion, then let people park thousands of domain names at no cost to yourself, while you take a big chunk of the profit. There’s very little downside. Hmm… you’ve got me thinking now.